CL35 loose clips are ideal for use with the CL35 solo clip pliers. 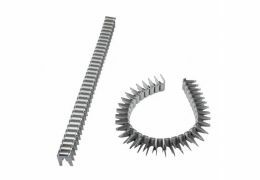 These galvanised clips can be used as a permanent secure fastening, providing maximum holding, ideal for creating gabions, animal traps, joining mesh sheets or rolls of welded mesh. These simple yet very effective clips are ideal for those looking at he occasional need for a strong long lasting fastening without the expense of pre-formed clips using automatic or pneumatic tools.